The Leave It command is an important one. One that I had failed to teach to my Big Boys for many years, and it cost me dearly. In dog bites, as I tried to fish unsavory things out of their mouths. Teaching your dog to Leave It will, hopefully, save you from this. It might even save your dog’s life, if he picks up something that could seriously harm him. Experts say that the Leave It command is pretty easy to teach. I say it depends on the dog. Teaching the Leave It command to my dog Jackyl, a stubborn Jack Russell Terrier, was probably one of the hardest things, and we’re still working on it. As with any other training, you’ll need [amazon_textlink asin=’B071Y3GSPY’ text=’high value treats’ template=’ProductLink’ store=’fosterpack-20′ marketplace=’US’ link_id=’6f380846-4cd8-11e8-abed-6f879d915f00′], and a quiet place, with no distractions to start. You’ll also need an item to practice leaving. A different treat, favorite toy, etc. We use a big dog biscuit as our item to leave, and small pieces of cheese or hot dog as our training treats. Work in short sessions, no more than 5-10 minutes, depending on your dog’s attention span. Put your dog in a sit, and show him the item to leave in your hand. As soon as he gets interested in the item, tell him to Leave It. And close your hand over the item. Most likely he’ll start pawing at your hand in an attempt to get the item. As soon as he stops this behavior, praise him and give him a training treat. It’s very important to NOT let him have the item that he is to be Leaving. If he gets it once, it’ll be harder to teach him to Leave It later. Repeat steps 1 and 2, until the end of your training session. Once he’s got the basic idea, start to try and leave your hand open with the item in it. But be ready to close it, should he try to take it. Eventually moving the item to the floor, or ground. Staying close enough to cover the item if need be. As he does better start increasing your distance from him, and the time he has to wait for the treat gradually. Change the item that he has to Leave It, and keep practicing. Eventually add in other distractions such as other people and dogs. Have patience. 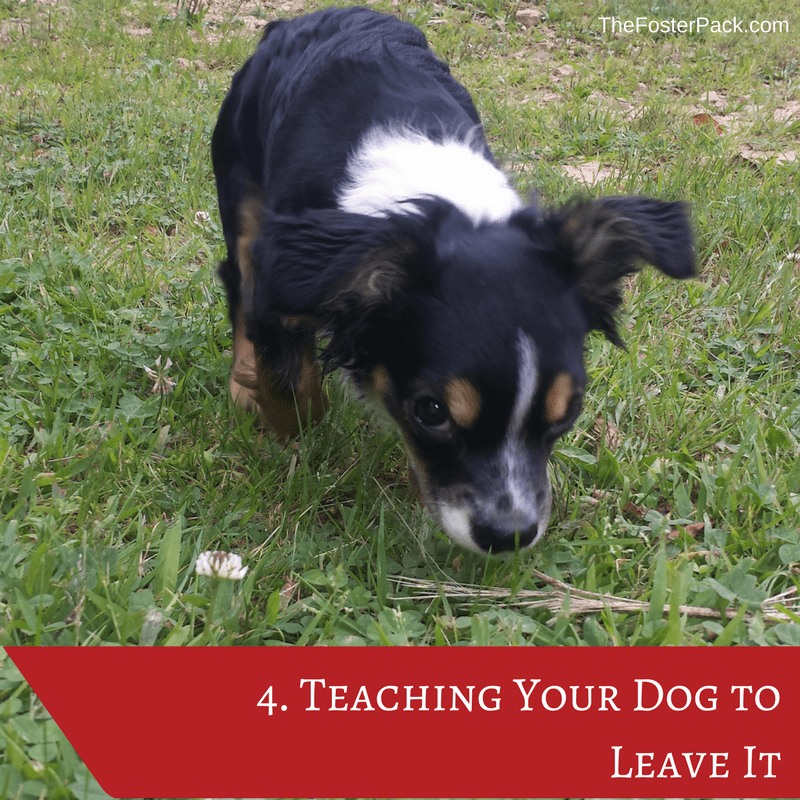 Teaching your dog to Leave It might be difficult for your dog to learn. But it you keep it up, he will pick up on it eventually. Then you’ll be able to tell him to Leave It with anything you come across. I’ve also found that practicing for a few minutes, with his bowl, at each feeding time really helped train my stubborn Jackyl.